The barred owl came to visit again! Our pal the barred owl was back yesterday afternoon, making himself (herself?) very comfortable on the top of our feeder stand for a good two hours. He seemed to be most interested in the goings on right below the feeder, no doubt waiting for a juicy mouse or other rodent to make its appearance. At times it looked like he was napping. 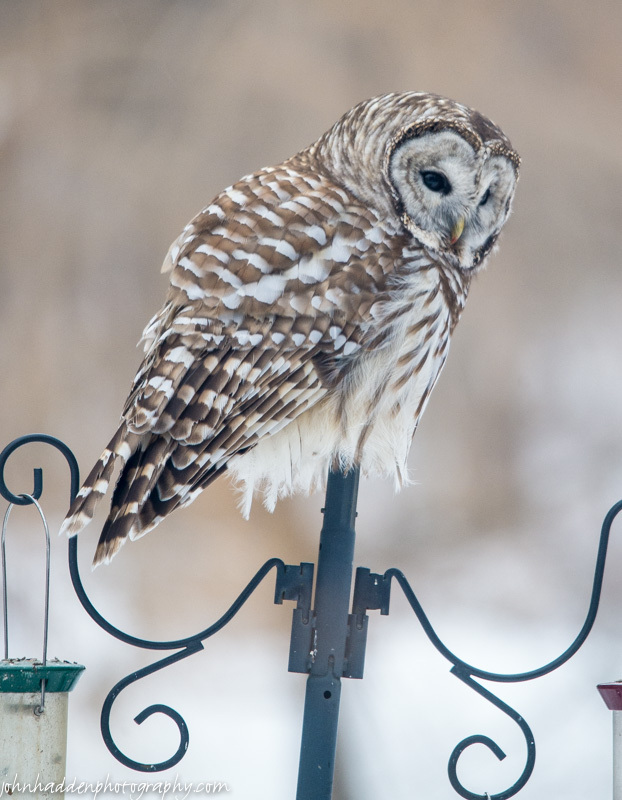 Interestingly, none of the little birds seemed to mind too much that he was there, as the chickadees, titmice, nuthatches, and even cardinals happily munched at our other feeders just a few feet away from the owl. Nikon D600, Sigma 120-400mm lens @ 330mm, ISO 1250, f/5.6, 1/200″ exposure. Thanks David! I had lots of opportunities to catch it as he was there for quite a while! What a beautiful creature! Seeing an owl in real life is currently top of my bucket list. I hope one day I can be so lucky. In the meantime, your stunning photos will have to suffice. You are an amazing photographer, and I would honestly click ‘like’ on all of them! Thank you Laura! I’ve been enjoying your photos as well. The very patient owl in my photo might well have been under some stress to be parked in the middle of the day. It’d been a long winter with deep snowpack making it hard for raptors to find prey. You’re very welcome. I plan on spending a weekend in Burlington and Stowe this year… if your photos in Huntington are anything to go by, then I’m very much looking forward to it! Lots to do in these parts depending on the season! Fall, of course, is spectacular if you hit it right!